It is with great sadness that we write to inform you today of the passing of our adored patriarch and the founder of SilverTowne (parent company of The Coin Vault), Leon Hendrickson. As many of you know, Leon was one of the most sincere and genuine people you could ever hope to meet. His passion for the collecting hobby and numismatics was surpassed only by his passion and concern for people. Leon leaves behind fond memories of his gracious spirit and kind heart. He was a trusted friend to nearly everyone in the numismatic industry, and he will be greatly missed. Leon spent his final days surrounded by his family, passing peacefully Sunday morning, July 23rd. Leon pleasantly welcomed the end of his life on earth, as he looked forward to spending the rest of eternity with his beloved wife, Ruhama (Hamie), who passed away seven years ago in August. A Memorial Service will be held at the Towne Square Community Centre in Winchester on Friday, July 28th at 10 am. Calling hours will be 2-8 pm on Thursday and one hour before the service on Friday (all at Towne Square Community Centre 123 W Franklin Street Winchester, IN). Please note the SilverTowne store/location will be closed all day Friday the 28th for Leon's memorial. In lieu of flowers, donations may be made to the Leon & Ruhama Hendrickson Family Scholarship Fund online at Community Foundation of Randolph County Donation Center mailing address 213 S. Main St., Winchester, IN 47394 or the Hendrickson Trust Fund at the Local Outreach through Main St. Christian Church mailing address 1212 E 100 S, Winchester, IN. Donations to either fund may also be mailed to SilverTowne L.P. PO Box 424, Winchester, IN 47394. Condolences can also be left online at Walker Funeral Home www.WalkersWinchester.com. Leon and Ruhama Hendrickson leave behind the legacy of SilverTowne and The Coin Vault. Three children, David Hendrickson (wife Debbie), two daughters Kathy Barker (husband Steve) and Tanda Abel (husband Tony). 10 grandchildren, 20 great grandchildren and 2 great-great grandchildren. Leon Hendrickson was born in 1926 in a Union City, Indiana farmhouse and spent his early childhood in Randolph County. Leon's lifestyle was, above all else, one that was emphasized with strong ties to faith in his family, community and his chosen profession. He was the coin dealer's coin dealer and also one of the greater collecting fraternity's stabilizing influences. Raised in a family imbued with a strong Quaker heritage, he was one of four children, three sons and a daughter, raised by Charles and Mary Hendrickson in a rural east-central Indiana farming community. Leon graduated from McKinley High School in 1944, in the midst of World War II, so college was not an option for him. Rather he chose to enlist in the U.S. Navy, and before his 18th birthday was aboard a destroyer and under enemy fire in the Pacific. 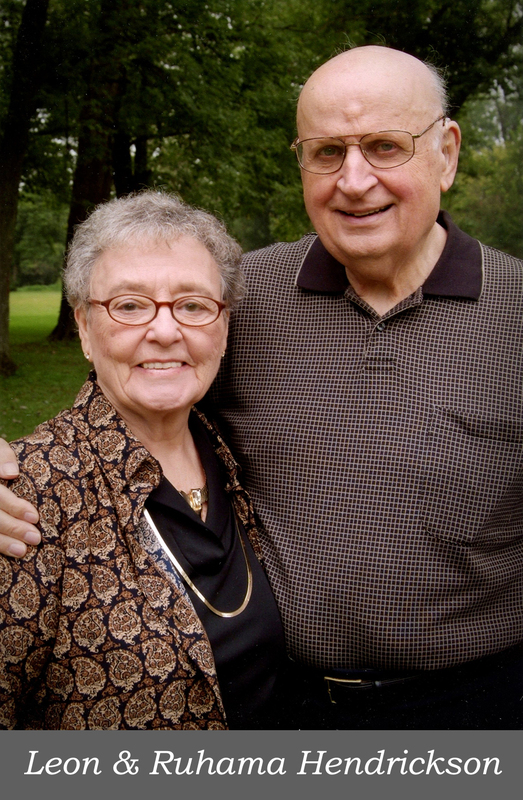 While still in the service, Leon married his high school sweetheart -- Ruhama Rhoades. Three years later young David made his appearance in this world followed by sisters Kathy and Tanda. Following discharge from the Navy, he lived briefly in Galion, Ohio with his new bride, Ruhama (affectionately known as Hamie). But it didn’t take long for the couple to decide to move back to Randolph County Indiana where they settled in the Winchester area. Leon soon became involved in farming, started a skating rink business, and ran a rural mail route. In addition to their other income-generating ventures, Leon and his wife became part-owners of a restaurant Hamie’s parents owned at the time. This is where Leon’s love of coins began. As he became interested in the coins customers were using to pay for their meals with, he soon began collecting the more interesting ones. This is how the coin business that would become SilverTowne started out of a cigar box under a lunch counter. Leon started dealing in coins full time in 1967. Leon often observed, in more recent years, in the early days of his coin business pursuit that it took all of those other jobs to support the launch of SilverTowne to keep it financially afloat. Leon was a very hard worker and constantly on the go, leading some acquaintances to observe, "they followed him around for a week before they wrote the job description of a workaholic." The business continued to grow from the cigar box to the basement of the Hendrickson home from 1958 to 1982. In March of 1982 the business moved to a newly constructed, high security, 12,000 square foot structure. Thought to be more than adequate to meet the requirements of the rapidly growing business, it was soon discovered that it was not the case. In 1985 another building of similar size was purchased and the manufacturing, smelting and custom minting departments were moved to a new location. Then within another 6 years yet another massive remodeling and expansion program was underway that more than doubled space for the jewelry department, a collectables room and larger more efficient shipping and receiving areas. Leon always found time - notwithstanding his constant coast-to-coast travels in pursuit of his numismatic business interests - to be a very involved person in his community, where he was a member of both the Better Business Bureau and the Chamber of Commerce. He was the 1987 recipient of the Chamber's Outstanding Business Leader Award Recognition. In 1982 he was named "Citizen of the Year" by the Winchester Lions Club. In 1988 he was the Grand Marshall of the Hoosier Celebration. He was a nationally recognized Numismatist with more than 22 accomplishments and awards. Leon was also an active member of more than 30 numismatic organizations and a former president of the Professional Numismatists Guild (PNG), Central States Numismatic Society (CSNS) and Indiana State Numismatic Association (ISNA). Leon’s memberships include being a life member in the ANA (American Numismatics Association) #LM692 and PNG (Professional Numismatists Guild) #170.